These boxes are handsome and durable. A clearly numbered plastic insert provides generous spacing for easy handling of the slides. The boxes are covered with heavy black embossed paper. Hinges and latch are nickel-plated and a numbered index lines the cover. 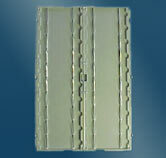 9¾" x 7¾" x 1¼"
Box is made of gray or white high-impact polystyrene. The bottom is lined with cork pads and a printed index lines the cover. The cover has steel hinge pins and a nickel-plated catch. Also suitable for 25 x 75mm slides. 8¼" x 6¾" x 1¼"
Box is made of glossy beige polypropylene and is molded in one piece including a dependable snap catch and durable flexible hinged cover. Numbers are molded in the center-dividing strip of the box. Also suitable for 25 x 75 mm slides. There are two versions of this box available. TheDeluxe (D) model has cork pads lining the bottom of the box, an index card glued into the lid and an individual packing sleeve. TheStandard (S) model omits the cork pads and the packing sleeve and has a loose pressure sensitive index to be installed by the user. 8¾" x 7¼" x 1½"
4½" x 3½" x 1½"
Heavy cardboard boxes with telescoping cover. The outside is covered with gray linen paper and the inside is white. A white die-cut insert holds the slides in place. The inserts for all 25 capacity boxes are numbered 1-25 and a corresponding index is printed on the cover. 3¼" x 2¼" x 1¼"
6¼" x 3¾" x 1¼"
(TOP) Heavy cardboard with mist gray finish. 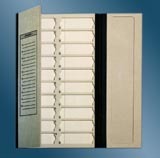 Features include two hinged doors with printed index and individual slide compartments. (BOTTOM) Box base of gray high-impact Polystyrene with clear plastic folding lid and plastic hinge. 7½" x 11½" x 3/8"
Heavy chipboard mailer with folding covers. 1½" x 3¾" x ¼"
3¼" x 3¾" x ¼"
Plastic molded one piece for 5 slides. 3¼" x 1¼" x 15/8"